The Esterbrook forum has been grayed out for more than a month, so I decided to start a new topic. I bought all six colors of the full-size J model because that's what I remember from my grade school days. All have different nibs and get used at one time or another. A neighbor offered me a nice red LJ for $15 so I bought it. I find it to be too slender in the hand. [ I offered it to my wife but she only uses her Pelikan 400. ] Then I ventured into the transitional J world, primarily because I wanted to try the nibs on them. They are every bit as comfortable to use as the Js, but there is a cleanliness about the lines of the barrel that I find attractive. I have no particular intention of expanding the modest collection, but I am curious as to how others compare their various Esterbrook pens. What do you like about particular models? Do you find some designs off putting, and why? Edited by corgicoupe, 25 July 2017 - 00:13. Red LJ. The LJ fits my hand best. Behind the LJ is/are my desk pens. Let's see, there are 6 Js + 6 LJs + 6 SJs = 18 pens. This does not count the icicles. I use a rather interesting nib. I get an old nib unit with a damaged nib, and take it apart. I replace the damaged nib with a generic Chinese nib (2-tone or bare stainless). Result is a nice F/M nib that writes smoother than many/most of the stock Esterbrook nibs. I do have two desk pens, one a recent purchase and one acquired from my grad school days in the 1960s. One is next to the computer and the other at the desk where mail gets addressed. I think I'll pass on SJs or more LJs. I'd like to see how you disassemble a damaged nib because I have one of those and a spare Chinese nib. Might be an interesting learning experience. I also have a spare section that I thought about using with a turned wood barrel, but I'd also need to make a base, since it would be a desk pen. 1 - Get a cup of water, stick in a wooden stick (I use a chop stick), then nuke it in the microwave for 90 sec. You want it HOT but below boiling. 2 - Get a long noise plier or hemostat to carefully grip the nib. This is simply so you do not get burnt by the hot water or hot steam. 3 - Dip the back of the nib unit into the hot water, so the entire collar is submerged. 6 - With your fingers, try to wiggle the nib out. The hot water will have softened the collar enough to release the tight grip on the nib. 7 - If you can't wiggle the nib out, repeat from step 2. Sometimes it takes a few repeats to soften the collar enough. 8 - With the nib out, rotate the collar 90 - 180 degrees. This is so that the indented notch in the collar is clear of the matching notch in the feed. 9 - Pull the feed out of the collar. #2 - Dry heat. Use a hair dryer or similar. Dry heat is usually the preferred method. This method only applies to nib units where a pin is NOT used to secure the collar to the feed. Then I ventured into the transitional J world, primarily because I wanted to try the nibs on them. They are every bit as comfortable to use as the Js, but there is a cleanliness about the lines of the barrel that I find attractive. I'm also partial to the transitional Js for pretty much the same reasons as you. I've got a nice red one that makes me really happy to use. I really like the Estie J, and have an array of nibs for that little darling. I am quite curious as to how we'll get along. From what I've read Yellow Esties are rather petite, but I have made fast friends with Parker Slimfolds, so am optimistic. Edited by Sandy1, 25 July 2017 - 05:52. Are there any gold nibs that one could fit it into an Estie? I think my one might be a J but I'm not 100% sure. Edited by ac12, 25 July 2017 - 17:30. 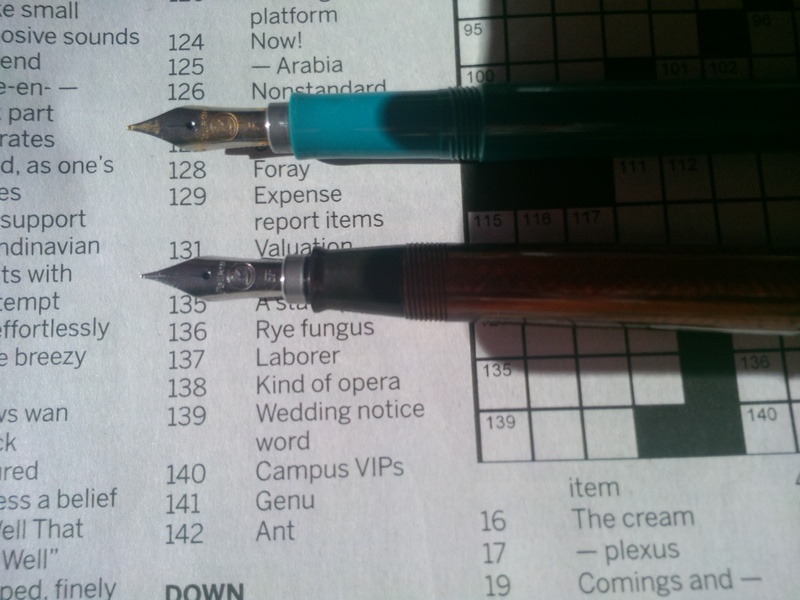 I put a Laban nib in my Mysterioso pen, which has an Esterbrook section in it. I put the nib into an Esterbrook feed/collar fairly easily. Edited by gweimer1, 25 July 2017 - 18:13. My favorite Esterbrook is the Dollar B pen. It just has a look and feel that appeals to me. The transitional J uses essentially the same barrel, which I think is a bit heftier than the J pens. My second favorite is the Deluxe LK series. The metal caps post a little more reliably, and I love the balance of them. Finally, I'm fond of the M2 pens, which are longer, and can feel a bit like a Parker 51 when you hold them. My latest (I need pics) is a UK-made version that has a 14K Relief nib, also an Esterbrook. I've always been a fan of Js as they are of both a comfortable width and weight for me, but I recently bought several dollar pens and now I might be favoring them instead. Not because of the width or weight, which are more or less the same as a J, but because they look really cool! I also have a fondness for the plunger-fill Safaris. I like J series pens, but only the "mackerel" ones -- I know a lot of people go "OOH AAH" over the "Icicles", but they don't do anything for me. Not overly enamored of the Dollar pens either -- I think the clips are kinda ugly. And I've only seen a couple of colors of the Pastels that I thought were really attractive. I keep looking for a J pen in the darker blue but haven't had luck in finding one that didn't have a nib I already have. For some reason, it's hard to find blue at all, and mostly they're the lighter blue (the only color I didn't get before getting a blue one was one of the "root beer" browns). Of the Esties I have I think the copper ones are the prettiest. Pelikan M2xx, M4xx nibs screw in, and the caps screw down. Edited by pajaro, 25 July 2017 - 22:06. Oh, now I have to try that! I have extras of both. My favorite is the Safari pump filler, which works like a Sheaffer Touchdown filler. A gold nib of the size of a Montblanc 144 nib, or like some older Waterman nib will fit into an Esterbrook sleeve. #2 nib, I think. I think a lot of us have. If the resulting writing angle works for you, and it works for me, this might be an interesting solution. These are steel M205 and M200 nibs. The M400 and M405 nibs fit the same. I have also put an M600 stubby broad into a J. Savage amusement. Edited by pajaro, 25 July 2017 - 22:17. The LJ carries easily, but is too slender for prolonged use. The SJ is too small. I am most comfortable with the "J". It is the same diameter as Transitional, Dollar Pen, and V-clip models, which are fun and fascinating to use. I have a dozen different nibs. I enjoy the variety, but have no favorite. For writing, I'll take an LJ all day long. Second would be a dollar pen I think. Although I don't really find any of them uncomfortable. For collecting, right now I'm focused on bandless dollar pens and Visumasters. $1.50 pens when I can find them, but to date I only have one of those. I am guessing that you think the transitionals are all Js. I thought that until I happened to get a transitional SJ in red. It has the cut off bottom of the barrel. Edited by pajaro, 26 July 2017 - 16:12.